“Don’t let the Dips get hot!”—the infamous maxim you will hear Senior Megan Ryan say when you hang around with the F&M Softball team too much. 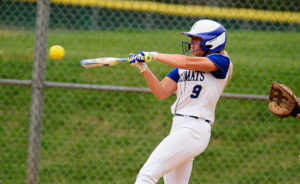 Bouncing back from a tough string of losses, F&M softball has been on top of their game lately with wins against both Haverford and Dickinson in their past two double headers. This past Tuesday night, in a double header against Dickinson, F&M pitcher Izzy Schaefer shut down the Red Devil’s offensive attack, allowing just two earned runs in 14 innings. Clutching two wins 4-3 and 6-0, F&M improved their record to 6-12 overall and 4-2 in conference. After three up and down innings of play, F&M Softball decided that it was time to take action. A push bunt single by F&M’s Crystal Good in the top of the fourth sparked the string of events that were to follow. A fielder’s choice by Dickinson allowed F&M’s Taylor Long to get on base, and F&M’s Lexi Piccinich hammered a double to left center to drive two runs home and take F&M into the bottom of the fourth with a 2-0 lead. The score remained 2-0 until the top of the seventh, when F&M’s Kelly Van O’Linda smashed the ball over the left field fence to bring in F&M’s Christine Miles, who had a single earlier in the inning. Van O’Linda’s first homer of the season, and second career overall, gave the Dips a 4-0 lead going into the bottom of the seventh. Progressing into the seventh, the Dips felt obligated to give the Red Devils some action because would it be a F&M Softball game if the Dips didn’t make it a little interesting? Entering the last half inning of the first game, Dickinson was able to adjust to Schaefer’s pitches and make something out of the time they had left to work with. Capitalizing on an error, a walk, and a double in the bottom of the seventh, the Red Devils scored two runs, with no outs for the Dips. Pulling as close as 4-3 to F&M, Schaefer produced two grounders and a fly ball to snag the conference victory. On a victory high into the second game of the night, the F&M bats stayed alive into and throughout the game. F&M’s Erin Russell started off strong with a leadoff single, which was immediately followed by a pair of Red Devil errors, giving the Diplomats a 2-0 lead after the top of the first inning. F&M expanded their lead to 5-0 in the second, squeezing out three walks before F&M’s Taylor Long delivered with a two-run, two-out double. Battling defensively, Schaefer continued to go the distance in the second game, scattering six hits and allowing zero earned runs in her second win of the day. At F&M’s next at bat, Piccinich clutched a single before F&M’s Gabby Goodwin came in to pinch run. Goodwin stole second and eventually scored on a single from F&M’s Katie Wenger. Clenching a 6-0 win, the Dips left the Red Devil turf with another two conference wins under their belt. The Dips faced off against Muhlenberg this past Saturday in a double header, losing the first game 8-2, but coming back full force in the second to clench a 9-3 win over the Mules. Come out and support Dip Softball at 3pm and 5pm on Tuesday, April 11th as they face off against Susquehanna in a double header at Baker Field. It’s only a young season for the F&M Softball team and the games from here on out are only the start to the Dip’s season long winning streak to come.